Today is the beginning of a week long blog tour to celebrate one of my favorite PDF pattern companies: Jalie Patterns. Auschick Sews and I are your hosts and we decided this tour would be the perfect opportunity to sew BASICS. 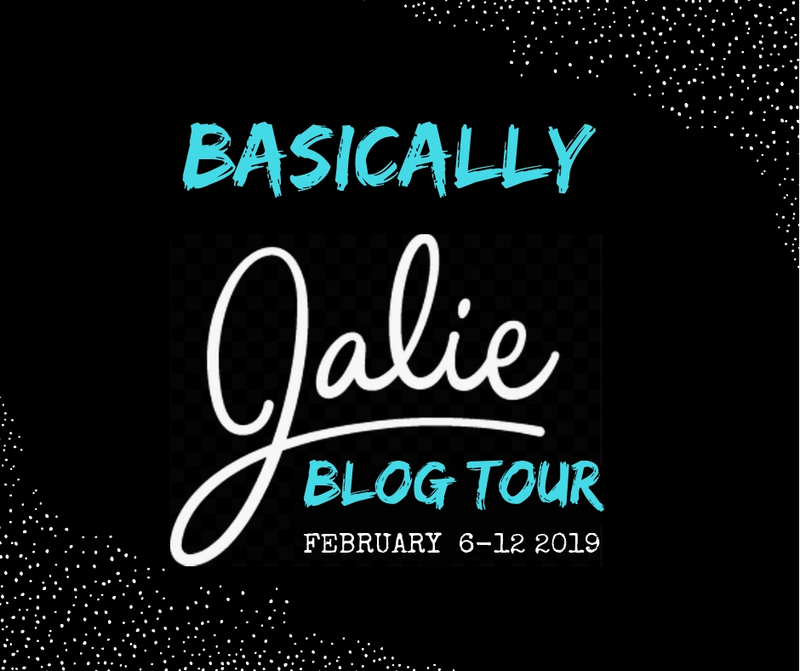 The Basically Jalie Blog Tour starts today and features 22 bloggers from February 6-12th, has a Rafflecopter prize and a sew-along component! The sew-along means that YOU can sew basics using Jalie Patterns and enter to win some amazing prizes from our sponsors! **Be sure to read through to the end of the post to find the blog tour schedule and links to each blog post on the tour, and then enter the Rafflecopter giveaway from our generous sponsors! Since moving to upstate New York USA, I am often COLD. I find myself wearing long johns under my pants, wool socks, and boots indoors. I was so excited that my fabric sponsor for this project, Discovery Trekking Outfitters, had dozens of cold weather fabrics to choose from! 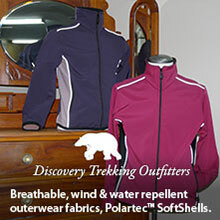 If you’ve never heard of Discovery Trekking Specialty Fabrics, you are missing out. This company, based out of BC, Canada carries the types of textiles you might find in clothing from your favorite outdoor clothing stores like: Patagonia, Nike, Northface and Lululemon. (In case you are wondering, they DO ship worldwide.) DTO has many Polartec fabrics including: Goretex (think water repellant AND breathable), PowerWool (think warm and wicking properties) and ThermoShell (fleecy warm fluffy goodness) just to name a few. They have plenty of fabrics for warm weather, too…I’m just stuck on all the cold weather ones because it’s winter. Can you blame me?! Anyway, if you want to learn more about the fabrics you carry, check out their collection of live Facebook videos from their warehouse. They are fascinating and very informative! The fabric I chose for my project is Navy Polartec Wind Pro FR (fire retardant). This is an advanced fleece developed to resist cold but has one tightly knit side to block the wind. The outer side of the fabric also repels water and is very breathable, making it extremely comfortable AND warm. This fabric is very stretchy across the grain (about 60%). It’s fire retardant, so no need to worry if you find yourself near a camp fire. Wind Pro FR is made from polyester. What surprised me when the fabric arrived, is how much the fabric felt like COTTON on the smooth side. It is super soft, and washes up beautifully! I was in desperate need of some warm Wind Pro pants I could wear with anything. The Eleonore Stretch Jeans seemed like a good choice, but call for around 25% stretch across the grain. Could I modify the pattern to work with my fabric? Since the fabric has a lot of loft (it’s thick) I didn’t want to completely size down. I decided to reduce the side seams on the inner and outer legs by one size and left everything else the same. (If you want a form-fitting fit, to just go ahead and size the whole pattern down…these ended up a bit baggy.) I used the skinny leg mod on the Jalie blog to reduce the ease for a straighter, slimmer leg. I knew that the pocket add on for the Eleonores could add too much bulk. I decided to draft my own patch pockets. It’s really easy! My pocket lining is a thin bamboo lycra that sewed into my pants very easily. Whenever I add patch pockets made of knit fabric, I stabilize the pocket opening with clear elastic. This helps the pocket opening keep it’s shape so it can lie flat against my hips. I omitted the faux fly (again, too much bulk for this fabric!). The waistband was modified slightly — I probably removed 3″ in length but I didn’t measure. I did sew in the waistband elastic, as instructed in the pattern. I loved using a reverse coverstitch for this project! So…as you can see it’s definitely a BASIC and it’s definitely not the item of clothing thing that I would be excited to post on social media. But guys…this is probably my favorite sewing project this winter! These pants are INSANELY comfortable…just super warm without being *icky* warm. They are breathable and soft and these pants are MINE and I’m probably going to wear them all of February and March and I’ll probably only take them off to wash them. Sometimes, lol. There is something funky going on at the front crotch. I’m wondering if I should have sized down a full size after all. I don’t remember this problem when I was wearing these with long johns yesterday. The pants are a little on the short side (with shoes) but a friend of mine called that ‘workout length’ and I agree. Perfecto! I know that you want to sew the FUN things: for me that would be colorful dresses and knit tops in bright colors. If you make most of your clothing like I do, take the time to make basics once in a while! I get more excited about sewing dessert, but I’m gonna need to pair dessert with basics and my basics will get worn 3x as much as the other stuff. A big thank you to Discovery Trekking for sponsoring the fabric for this project! Please visit all of the other blogs on the tour and don’t forget the Rafflecopter giveaway below AND the sew-along. 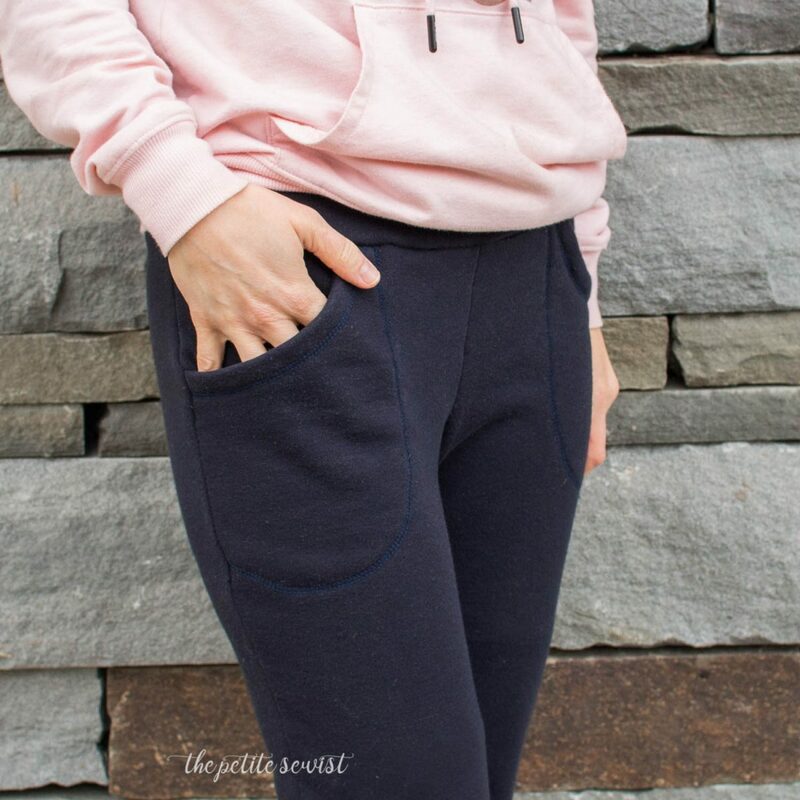 We are so excited to see the Jalie basics you sew up! The force is with you indeed! I am the force and the force is with me! Brenda, we just need to take a trip over the border to snag some pretties! I love this idea! These look so comfortable! I live your pants and I’m so glad this tour introduce me to DTO! NY is soooo cold – but finally breaking. You rock! I love those pockets you drafted..
Love these so much! What a great basic! Thanks for the clear elastic tip too!! Jalie has some great patterns! Nice to see this tour! These are really cute – we’re in a deep freeze right now, these would be like secret snow pants, cozy warm all day! And I just spent way too much time adding to my Jalie wish list! I always like posts about basics on instagram and blogs so post away!! I like these pants. 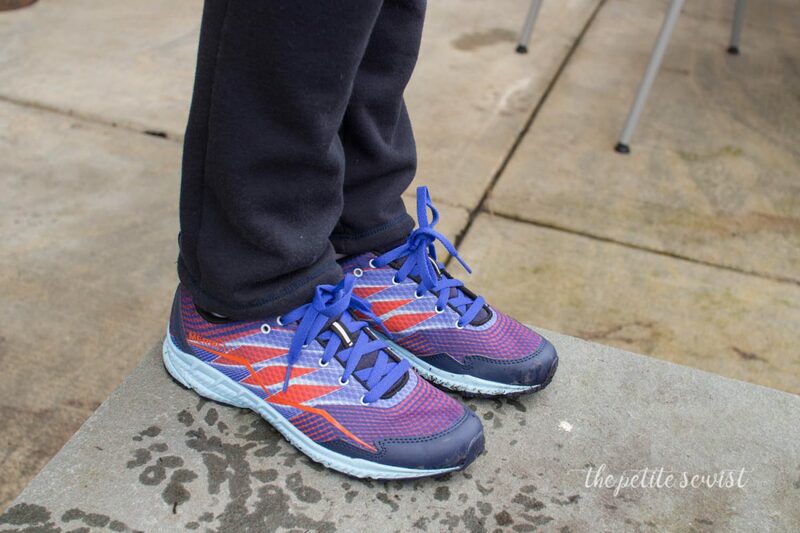 In the photos, the fit looks perfect for an active lifestyle! I will be visiting Discovery Trekking Outfitters in the near future. The fabric sounds perfect! I’ve been drooling over Discovery fabrics but the shipping cost scared me off. I might have to bite the bullet and get some though. Your pants look wonderful! These are darling and I love the fit! I’m now inspired to use fabrics like this. We can think about sewing dessert when it’s spring – for now, we all just need to be warm. Also, thanks for introducing me to DTO. I’ve bookmarked them under my “resources” tag! I love how you’ve used this pattern! I never thought to use the eleonors with a fleecy fabric. And I adore your pockets!! Great adaptation! The pockets you drafted are perfect! The whole outfit looks comfy AND cozy! Great job! Lovely pants! They look great! What a great idea to use a jeans pattern to make these! They look so comfy!! These are such a great wardrobe staple! That fabric really intrigues me and I love how you used it. Thanks for organizing the tour and being such an inspiration! Thank you, Leslie, you are too kind 🙂 I just had to make pants with this fabric and was bummed Jalie didn’t have a knit pattern for 2 way stretch. But then I had a ‘Tim Gunn’ moment and the Eleonores were perfect! Ooh, I wish DTO was in Australia!! What a great range of fabrics they have, and I’m loving how those Eleonores look slimmer down! They do ship worldwide, if you’re interested. These look amazingly cozy and comfortable! That fabric looks plush! I didn’t recognize these were Eleonors. Great job!! Those look really comfortable, and goodness knows it’s the perfect winter to have a pair of fleecey pants to wear. 🙂 Nicely done! wow those pants look sooo comfy!! Totally everyday wear! This is exactly what I’ve been looking for. My mother lives with us in northern NJ and she is always cold, even in the house. I want to make her some WARM pants! These would be perfect. Oh my goodness, yes! This is the perfect fabric. Your poor mom might also benefit from some base layers under regular pants – I wear them with all of my jeans. I couldn’t believe that you used Eleonor to make those great looking pants! I need to try them with French Terry now! Thanks Deb! Post them when you do make the FT ones, I’d love to see them! Love the pants! Thanks for the tips on fabric sources.